Individualized newsletter templates go a long way. They convey your company’s style and a professional touch to email marketing campaigns. Our programmers will design a newsletter template for you in HTML. Once a customized template has been created, you can reuse it to your heart’s content, with varying content and images. We would be happy to create a newsletter template for you that is perfectly in line with your corporate design and that is optimised in more than 37 email clients. Why is it so important to have a newsletter template optimised for all mobile devices? There’s a growing number of people who browse Internet and check email primarily on mobile devices and this trend shows no signs of slowing down anytime soon. 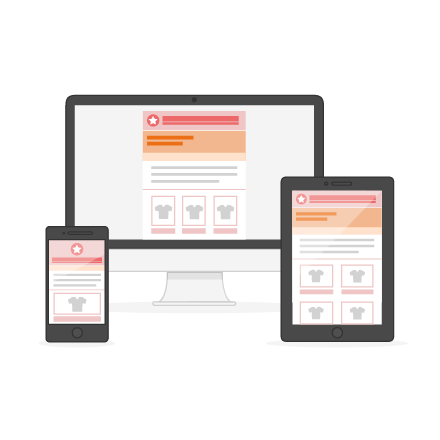 With responsive design, product images as well as buttons will scale automatically. You don’t want your prospective customers to not be able to read your newsletter or have them scroll through it to make a purchase. Beat your competition to it and attract more customers with a newsletter that answers their needs! You can order an individualized newsletter template directly from your account. Once you’ve logged in, go to Account and then choose Template. Still don’t have a template in mind? Don’t worry. As far as the design of your newsletter is concerned, you can either come to us with a finished design or get us to do the first draft for you. We will get in touch with you straight away. Alternatively, you could email us at moc.o1556129577g2ret1556129577telsw1556129577en@se1556129577las1556129577 Expect to get a short questionnaire to accommodate your design needs. After you’re satisfied with the concept, we’ll begin coding your email newsletter in HTML. After 1-2 rounds of feedback your template is programmed. Order your individualized newsletter template now from your account. Check out this website to get an idea of what premium templates might look like. Visit this website to learn more about our competitive pricing. Let us design the perfect template. Take advantage of other services Newsletter2Go offers. Lean more about our newsletter tool and our ecommerce newsletter software. If you run an online web shop, we have a special offer for you that will save your precious time. We could connect your newsletter template with your store. If you’d like that, you’d need to fully integrate your online shop with Newsletter2Go. That means that once we program your template, we will insert a special block that allows for 1 click product transfer. That option will enable you to copy your entire product to your newsletter simply by entering the product number. Don’t waste time transferring product name, description, image – our feature will do it for you! We would like to get you to create a template for us in our design. What do you need from us? I would like Newsletter2Go to create a custom newsletter template for me in my shop design. How do I go about this? Can I create a HTML newsletter template with web shop integration – including article transferral – e.g. to Magento, xt:Commerce or plentymarkets, myself? How can I use a sent newsletter as a template? Can I influence the design of my web shop template?